In our last post, we covered the lobster roll basics and got you started on a few of the choices available in Kennebunkport. One of the things that we say to our guests is that they should also consider the atmosphere when deciding where to go for their lobster roll. Some places have a much more charming, authentic, Maine coast dining experience than others. Our personal favorite for any kind of lobster is Nunan’s Lobster Hut in Cape Porpoise. This quintessential Maine lobster shack has been owned and operated by the Nunan family since the 1950’s and offer a very traditional lobster roll at a good price. Even though they say they do ‘lobster, lobster and lobster’, the menu does feature other seafood choices as well as a burger, chicken sandwich and grilled cheese sandwich (for kids and those who don’t eat lobster). Owned by lobstermen, their lobster is always freshly caught and the prices are very good. This seasonal lobster shack favorite operates seven days a week, evenings only, from May through October. They don’t take reservations, only accept cash and are absolutely a must stop for the serious lobster lover when visiting Kennebunkport. In the peak summer months, the wait to get in can be up to an hour, but well worth it. Cape Porpoise is the Kennebunkport fishing village. It has a working port with lobstermen going in and out all day. 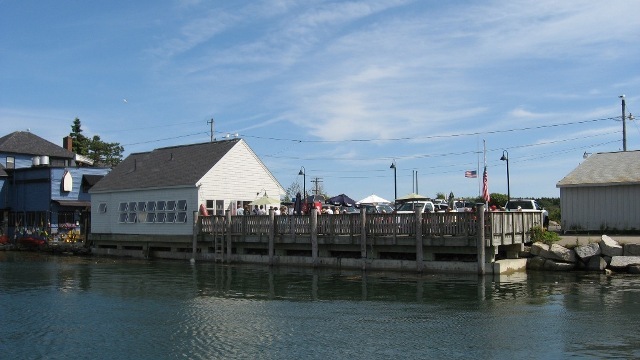 Situated on the edge of the port is a little gem called Cape Pier Chowder House. They offer a traditional style lobster roll made with succulent fresh lobster meat on a hot dog bun. Their prices are reasonable and they have a good selection of other seafood options on their menu. They offer a few non-seafood dishes and something for kids too. This is no frills dining, but what really sets them apart is their location. You dine on the pier at picnic tables watching the boats come in and the sun go down. Open lunch or dinner, they can’t be beat for sitting with a cold beer or glass of wine enjoying your Maine coast holiday. We’ve saved Port Lobster for last as this is a seafood market versus a restaurant. This is our go to place to buy lobster for our 1802 House Lobster Roll (more on that in our next post!). What we love about Port Lobster is that you can stop in to purchase their “Lobster Roll Lunch Box” for $12.99 which includes a traditional style lobster roll, coleslaw and chips and you’ve got a Maine picnic ready for the beach or any other favorite Kennebunkport destination that you have in mind. You choose the atmosphere that suits you! As we said when we started out, there’s a lot of choice for lobster rolls in Kennebunkport. Sorry, we aren’t even going to try and tell you who has the best lobster roll. We are going to leave that for you to decide. Try them all and let us know what you think! Hope to see you soon at the 1802 House Bed and Breakfast.